You need reliable air conditioning services from an HVAC contractor in Lake Norman, and we’re here to deliver. When summer arrives in the Lake Norman, North Carolina area, you know one thing’s for sure: you’re going to rely on your air conditioner to keep you nice and cool all season long. If you want to make this a reality, however, you’re going to need reliable, effective air conditioning services from an HVAC contractor you can trust. Air conditioner repair—When your system breaks down, you only need to make one quick phone call to our team! We’ll arrive at your home right away to get your system up and running again. Air conditioner replacement—Your air conditioner is getting old, unreliable, and inefficient. When this happens and you’re ready to invest in a replacement, we can help with all stages of the process. Air conditioner installation—Whether for a new build or as part of the replacement process, we install new air conditioners with complete precision from start to finish. We also install and service most major brands, including Bryant, Trane, American Standard, Carrier, and more. 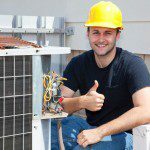 Your air conditioning needs are in good hands when you rely on us here at Cool Comfort Heating & Air. To find out more about our air conditioning services and what they include, get in touch with us today. We look forward to hearing from and working with you! At Cool Comfort Heating & Air, we provide high-quality air conditioning services in Mooresville, Huntersville, Lake Norman, Cornelius, Denver, Troutman, and Davidson, North Carolina.